Cherry City Kitties : Ta-Da! Our first Giveaway! 3. Leave a comment on this post and tell us who you said your Thank You too and you will be entered! We will leave things open until Friday at Midnight and then pick our lucky winner on Caturday! Again, thank you to all our new friends, purrs and love. This is an awesome giveaway! ...I just won a new bed so you don't need to enter me...but good luck to all the entrants! It's nice to meet you! Concatulations on your 1st giveaway! Like Katie and Glogirly, we just won a new bed also, (from the BlogPaws Catification Longue) so please don't enter us in the giveaway either. If just wanted to stop by and introduce ourselves. Moki The Wobbly Cat and Mom C.
I love your idea for your giveaway! And that mat looks awesome. I will have to come back after I have followed your instructions - just because I think it's such an awesome thing to do! That looks like a great mat and we would love to win that. We are going to find you on Facebook. 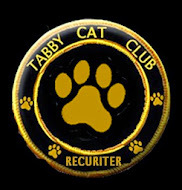 We also have told Tabby's Place how much we appreciate all that they do. Off to Facebook. We have left a comment at animalsheltervolunteerblogspot.co.uk and have come back to tell you so we hope we can be entered into give away. We liked you under both of our names....personal and fan page! We LOVE that mat!!!! Cody is just wanting it soooooooooo badly! Thanks for such a great give-away! Welcome to the CB. I've been very busy with my Nip-A-Thon so I haven't had much time to visit. I'm a lady cat but blue is my color. It would be so comfy for me to put on a favorite chair. Ooooooh, yeah. My favorite rescue doesn't have a FB page and we may be making one for them soon. I did leave a comment on Brookes Legacy Animal Rescue: Any updates on how Traffic's amputation went? She's my foster cousin. Sending healing purrz. Hope you liked the blog post I did about you on the 15th. Couldn't find you on FB. What name should I be searching for?? Hola Keisha! I think you have us confused with someone else, partially anyway. We don't know Traffic, but we send purrs for her surgery. I think your blog was about her on the 15th. but it was a really good and important blog post, so well done. We're on Facebook as Cherry City Kitties, so come check us out too. And you're in the drawing! Don't forget to tell us who you said "Thank you" to so we can enter you big guy! The mat looks so cozy- my kitty would love to snuggle on it. A great giveaway! Glad you like it Georgia, please write us back and tell us what kitty group you said your "thank you" to. We love to hear about all the groups out there helping kitties. Hi... Congrats on your 1st givaway! We popped in to meet your friends at UN-Cats feline rescue and left them a BIG thank you! The mat your momma made looks really comfy & cozy and there are a couple of little girl kitties here who would enjoy napping on a pretty new bed. Great to meet you! We did pop into your Facebook page and liked you but didn't see our page come up so we don't know of it came through...we noticed everyone else who "liked" you had pet facebook pages so maybe that is why.LP isn't too computer savy. We also coincidentally thanked Random Felines today for all the work she does with fostering cats (alot!) as she just lost one of her foster kittens today and had the sads. wooly AND squishy?? The Crew would LOVE that. what a wonderful thing to have for a giveaway! I know, what a great combination! Please let us know what kitty group you posted a "Thank You" too so we can go meet them. OMC! What a super dooper give a way. Looks sooooooo comfy. Great for catching naps for sure!!! Ms. Gracie, did you remember to leave a "Thank you" to a kitty helpin' group out there, we are going to visit all the groups you all are listing. Wow whoever wins this is gonna be sitting and sleepin in style. Momma doesn't let us do FB. So we can't enter but we think the winner will really enjoy this great cushy spot to nap on. Well, we won't argue with your Momma so tell us all what kitty lovin' group you would give a shout out too and we'll call it good! My Mommeh said we already have too many beds so I am not going to enter, but I wanted to let your mom know that the bed looks so pretty and cozy! That is so handsome and looks so comfy! we know we would love it! So count us in, please. Your mom does very beautiful work. Our mom sews like its still the stone age. Oui Oui, did you remember to say a Thank You to a kitty rescue group or the like? It's part of the deal. We're makin everyone work for it! Maxwell: nice to meet more man-cats in the blogosphere! FaRADaY: Yes, an' we noticed those beds were a nice BOY BLUE - woot! We think the beds look awful cozy but we don't need one our own furselves. But we did go by Spay Neuter Kansas City to tell them thanks for what they do - thank YOU for reminding us to do that! Sorry, we didn't realize we needed to do that. We are going over to Animal Shelter Volunteer Life now. They are one of our favorites cause they take in less than purrfect kitties no other shelter would take, rehab them and then find them homes. This looks pawsome! We don't enter competitions though because we're in Malaysia and overseas post is expensive. We shall ask for one of these from the survunts as we only have sofas and beds and boxes and stuff and we really really need a pillow. Thanks for the kind comments on our Mousebreath interview! We enjoyed it too.